We know a lot of you have been waiting for more information on T-Mobile’s upcoming 4G superphone, the HTC Sensation 4G, and we’ve got some good news for you. T-Mobile and HTC have just revealed a little bit more information on T-Mobile’s upcoming fastest and most powerful 4G phone yet, the launch date. The Sensation 4G will be available online and in T-Mobile stores starting June 15th, and if you can’t wait for June 15th, you can head to your local Walmart as soon as June 12th. No price has been announced just yet but if we had to guess it would be in the $200 on two-year contract with data plan range. For those who don’t know, the Sensation 4G is loaded with features like a speedy 1.2 GHZ dual-core processor, 8 megapixel back camera with 1.3 megapixel camera on the front for video chat, 4.3 inch qHD high-res screen with aluminum unibody design (so things look good on the phone and off it), and the latest and greatest version of Android for phones, version 2.3 Gingerbread with HTC Sense 3.0. Basically, it’s not just T-Mobile’s most powerful 4G phone, but one of the most powerful phones ever released in the US. For full details on the Sensation 4G see our previous post here. So T-Mobile users, who’s looking forward to June 15th? UPDATE: And just like that the price is official. Just as we guessed it’s $200 with 2 year contract, data plan and $50 mail-in rebate. Is This Nintendo’s Wii 2? Is this the Wii 2? With the big video game conference E3 only a few weeks away the rumors on what’s next in the video game world are beginning to spread like fire. Obviously we expect to learn a lot more about Sony’s forthcoming NGP (aka the PSP 2– hopefully this will include a price and release date) and what Microsoft has planned for the future of the Xbox 360 and Kinect (which has been surprisingly quiet since its big launch last year. In the past 6 months since its been out we’ve hardly seen any new games that take advantage of its awesome controller free gameplay). In Nintendo’s case however things look to be going a whole ‘nother level with a preview of the next generation of the Wii currently code-named “Project Cafe.” Nintendo has even confirmed that this E3 they will talk about the Wii’s successor. So what are the latest rumors saying we can expect in the Wii 2? Well, if they are anywhere near true, Nintendo is back in the hard-core gaming market— and in a big way. Thought Apple’s usual back to school deal of a free iPod Touch with a new Mac was a good deal if you were looking for a new computer for college? Well this year we think you’re gonna wanna hear what Microsoft’s offering first. Beginning this Sunday, May 22nd, and running through September 3rd Microsoft will be giving away free 4 GB Xbox 360s with all new PC purchases of $699 or higher. All you gotta do to get this offer is show your Student ID if your buying in a store or a enter your .edu email address if you’re buying online (this is the email address your college gives you once you enroll). What? As we all know school, particularly college, is very stressful and there are many educational benefits to video games. Sadly this deal looks to be for college students only so anyone looking for a new PC for high school won’t be able to take advantage of this offer (unless of course you have a college bound friend or sibling with the proper ID that’s willing to help you out). We’ve reached out to Microsoft to see if there are any deals for high school students and will update if we hear anything back. So, what’s it gonna be for your new college computer– Mac and iTouch or PC and Xbox 360? UPDATE: As Katie pointed out in the comments, this deal will work for high school students as well. If you are buying in a store (like at a Best Buy) all you have to do show your student ID and you should be ok (though to be on the safe side give your local store a call before you go in to make sure they are doing this deal and will accept a high school ID). If you’re buying online (like at Dell.com, HP.com etc. ), and you don’t have a .edu email address, you should try chatting with an online sales rep or calling the company’s sales line (the phone numbers are usually listed at the top of the sites) to get the proper account numbers and links for where to buy your new PC and get your free Xbox. For all of you on Verizon waiting to get your hands on the Xperia Play (aka the PlayStation Phone) your lucky day is almost here. The final piece to this long, leaked puzzle is finally in place with Sony Ericsson and Verizon today finally confirming the release date and price for this gaming beast: next Thursday, May 26th, for the as expected $200 on 2 year contract and data plan. Sony Ericsson also confirmed that each Xperia Play will be shipping with 7 full games pre-loaded on the phone— Madden NFL 11, Bruce Lee Dragon Warrior, Asphalt 6: Adrenaline, The Sims 3, Star Battalion, Crash Bandicoot, and Tetris– with an additional 50+ games available at launch via the V Cast App Store. And yes, it’s also a full Android 2.3 Gingerbread phone so you can also get any apps available in the regular Android Market. On top of all that you also get a high-res 4 inch screen, 1 GHZ processor with 512 MB of RAM (so your games will look and play great), and a 5 megapixel back camera (with flash and HD video recording) with a second front camera for video chat. Pre-orders for the Xperia Play will begin on Verizon’s site starting this Thursday, May 19th, and for more details on the Xperia Play make sure to check out our first look from CTIA. Verizon’s first few months of 2011 have been very impressive– the iPhone, expansion of the 4G LTE network and the launch of their first two 4G LTE phones– the HTC ThunderBolt and Samsung Droid Charge. For the past couple of weeks we had to a chance to test out Verizon’s first 4G phone, the ThunderBolt, with its killer 4.3 inch screen, 8 megapixel back camera with 1.3 megapixel front for video chat, fast 1 GHZ processor and of course, that blazing fast 4G LTE (spoiler: it’s ridiculously fast). To say this phone is loaded would be a dramatic understatement. But how do these impressive specs hold up in real life, and more importantly, if your on Verizon is it worth being your next phone? For all that and more read on for our full teen review! While this deal isn’t as mind-blowing as AT&T planning to buy T-Mobile, it’s still pretty insane. What you’ve read above in the title is correct– Microsoft has just bought Skype for a crazy $8.5 billion (yes, that’s billion with a “B”). With the amount of people who use Skype constantly it doesn’t take a brain surgeon to figure out just how huge this deal could be on a whole bunch of levels, but let’s focus on what you really care about: what exactly this all means for you. It seems that every big company has their own video chatting service– Apple has FaceTime, Google has Google Talk, and even Microsoft has had one with Windows Live Messenger– with all these companies investing a whole lot to make sure that when you and your friends video chat it’s on their service. This Skype deal will give Microsoft a significant advantage in this game. We wouldn’t be surprised to see Microsoft announce a whole bunch of new Skype apps for Windows Phone 7 (which was already said to be getting a Skype app pretty soon) and Xbox 360 Kinect that makes video chatting from your phone or couch a whole lot easier and better (and yes we know that means that Microsoft will need some new Windows Phone 7 phones with front cameras for video chatting– they also announced yesterday that the next version of Windows Phone 7 will be shown off at the end of the month, and we expect more on this there). This is great news for anyone with a Kinect or wants a Windows Phone. This mobile video chatting game is getting very intense very quickly– and we can’t wait to see what Apple, Google and all the other competitors come up with next to fight off this new powerful MicroSkype. Stay tuned! We had a feeling we’d get more information on AT&T’s 3rd big 4G phone— the Samsung Infuse 4G– this week, and at an AT&T/Samsung event this afternoon more details is just what we got. Coming May 15th, for $200 (with the expected new 2 year contract and data plan), if you’re looking for a blazing fast 4G phone on AT&T this is for you. 4.5 inch Super AMOLED Plus screen– Basically, its awesome and should make everything you view on it look incredibly nice and clear. 1.2 GHZ processor— For making sure apps and games run quickly as well. Android 2.2 with Samsung TouchWiz UI— The Infuse also comes pre-loaded with a special version of Angry Birds with a level exclusive to Infuse 4G owners! Ridiculously thin design– At 8.99 mm thin (9.24 mm at its thickest part along the bottom) you won’t have any problems putting this in even the tightest of pockets. 2 GB microSD card included with support for up to 32 GB— In case you need more storage for your music, movies, pictures and apps. Samsung and AT&T are also bundling in a $25 Samsung Media Hub (Samsung’s version of the iTunes movie store) gift card with each purchase so you can buy new movies or TV shows to watch on that awesome screen right out of the box (for this we’d recommend looking for a bigger memory card). So yeah, if you’ve got an upgrade on AT&T coming up we’d definitely recommend waiting a few more days for this beast to come out. For more info on the Infuse 4G check out AT&T’s site here. 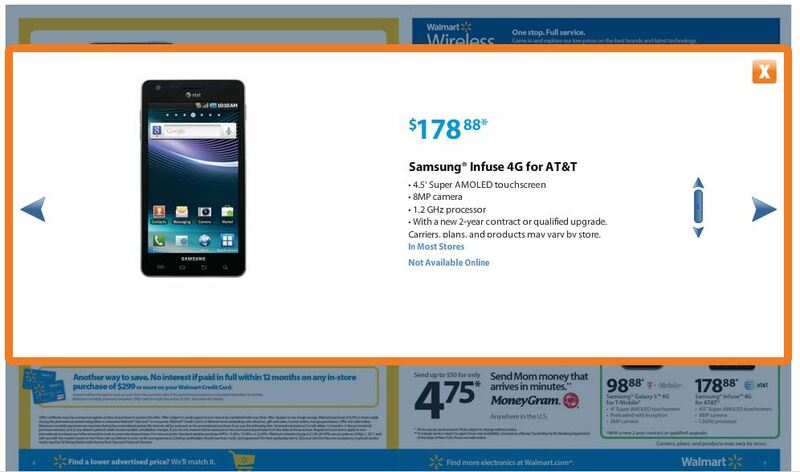 Samsung Infuse 4G Makes Appearance in Walmart Ad– Release Coming This Week? We know a lot of you are very eager to learn more about AT&T’s third 4G phone, the Samsung Infuse 4G, and we’ve got some good news for you: it’s almost here. That pic you see above? 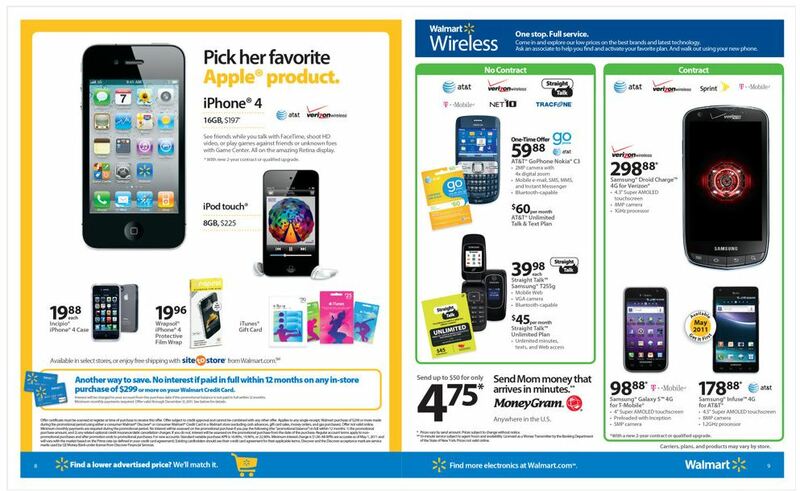 That’s Walmart advertising the Infuse 4G for a very solid $178.88 on two-year contract with data plan alongside a nice little sticker saying it’s coming May 2011 (click on pic to enlarge). Clicking on the pic of the Infuse 4G on Walmart’s site (it’s on page 9 in the ad) brings up a pop-up– shown below– listing the already familiar specs of the Infuse 4G (8 megapixel camera, 4.5 inch Super AMOLED screen and 1.2 GHZ processor) and a note that it’s available in most stores. Well, we called up a couple of local Walmarts and while they told us they don’t currently have the Infuse 4G in stock, they said they should have them in by the end of this week. And just to add a little more fuel to the fire here, AT&T and Samsung have sent out invites today for an event this Thursday, May 5th in New York City (though what exactly will be announced at this event is still unknown). Unfortunately we won’t be able to make it out to this event in person, but don’t worry, we’ll have whatever is announced covered for you right here. So hang tight Infuse 4G fans, it’s almost here. It’s finally almost here. After months of leaks, the long-awaited BlackBerry Bold Touch is now finally official. Coming this summer, this new Bold looks to pick up as we all expected right where the previous Bold 9650/9700 (depending on if you are on Sprint/Verizon or AT&T/T-Mobile) left off. BlackBerry OS 7– Formerly known in the rumors as BlackBerry OS 6.1, this new OS includes updates to make using your BlackBerry much easier. Updates here include a better and faster browser, nicer looking icons and menus, and universal search and voice search for finding things on your phone. And for all those wondering if you can upgrade your current OS 6 running BlackBerry, RIM has said OS 7 will not work on older BlackBerry 6 phones only the new ones they release (like this Bold). 2.8 inch touchscreen with normal BlackBerry keyboard underneath– With a resolution of 640×480 everything– text, pix, videos, games, websites– will look incredible on here. And while it is a touchscreen (which we know some of you BlackBerry users might not want on your BlackBerry), it’s not a slider like the Torch and still has the trackpad and other BlackBerry buttons right below the screen and above that traditional, awesome BlackBerry keyboard so you can use it just like any other BlackBerry Bold. Crazy thin— This is one of the reasons we said we think it’s the best looking BlackBerry yet: just look how thin it is! 1.2 GHZ processor and 768 MB of RAM– Basically, this will be the fastest BlackBerry yet, by far. WiFi, GPS, and NFC— NFC, or near field communications, will allow you to do things like use your phone as a credit card (in a safe and secure way) or interact with ads or billboards (think of it like those QR codes you see everywhere just now without the need to take a picture of anything. You just tap it or go near it and it works). As we said above, this will be available “this summer” (when exactly and for how much is still anyone’s guess) for most probably all 4 US carriers: AT&T, T-Mobile, Sprint and Verizon (AT&T and T-Mobile will get the GSM version called the 9900 and Sprint and Verizon will get the CDMA version the 9930. Both have the same specs you see above). T-Mobile has already even confirmed that this new Bold will be their first 4G BlackBerry (something we assumed would happen when we saw the leaked specs and that it had support for HSPA+ 4G, the 4G used by both AT&T and T-Mobile), and we don’t expect it to be too long until the others follow suit. So BlackBerry users: like what you see or do you want more from RIM (like one of those other leaked phones) for you to stay with a BlackBerry over an iPhone/Droid/Windows Phone 7?